From the outside the Aquarium looked a lot like the Space Museum--BIG. "Hey, Sam Wu-ser! Do you have a stupid outfit for the aquarium, too?" It was Ralph. Only Ralph thinks it's hilarious to call me Sam Wu-ser--because it rhymes with loser. Sam's Wu's nemesis, Ralph Philip Zinkerman III, has made it his life's work is to let nobody in the class forget that unfortunate INCIDENT at the Space Museum. So Sam hides his fear when Betty the Aquarium Lady puts his hand right on the back of a real stingray. But touching a stingray is nothing compared to that holy terror in the shark tank, Crazy Charlie, who seems to have his eye on no one but Sam. THEN THE SHARK UNHINGED HIS BIG JAW AND SHOWED ALL ITS TEETH... AND CHARGED. AARRGH! said everybody who had seen Crazy Charlie ram his head into the glass. Except... Ralph Philip Zinkerman, who laughs and points at Sam. 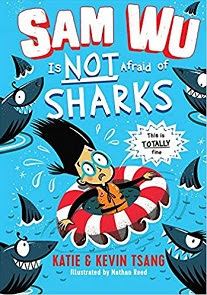 "Scaredy Cat Sam is scared of SHARKS!" At least I hadn't wet my pants like I did at the Space Museum, Sam thought. Sam figures he's pretty safe from sharks as long as he stays away from large bodies of water, but of course Ralph's parents make him invite everyone in the class to his birthday party, and of course his birthday party is at the BEACH, which means that the shark-infested ocean will be only a few steps away. Sam's Space Blaster buddies Zoe and Bernard remind him that they will be there with him. They do research at the library on sharks, and Sam screws up his courage to venture onto the beach. He's planning to stay busy building sandcastles safely away from the waterline, but then he sees a black fin approaching an old man in the water. He is even older than Na-Na. If ever Na-Na is ever in the ocean and about to be eaten by a shark, I hope someone will save her, too! "Do you think you could come over sometime and get the zombie werewolf out of our basement?" Katie and Kevin Wang's first book is Sam Wu Is Not Afraid of Ghosts (see review here).